An offshoot of the Occupy Wall Street movement has responded to the Connecticut massacre, calling for gun control policies that will save lives. In recent months, Occupy Wall Street has proven to be a versatile force capable of tackling a variety of issues from inequality to Hurricane Sandy to crippling debt. Occupy’s Rolling Jubilee raised somewhere around $450,000 to abolish millions of dollars worth of personal debt, and Occupy Sandy and Occupy Our Homes were able to get aid into the hands of New Yorkers and arrange temporary shelter for displaced families much faster than the state or federal government or prominent charity organizations like the Red Cross. Now, an offshoot of the original movement says it plans to unleash the power of the 99 percent on the National Rifle Association. In the wake of the tragic elementary school massacre in Connecticut, the group launched Friday afternoon with a Facebook page, “Occupy the NRA,” which currently has over 3,300 likes. 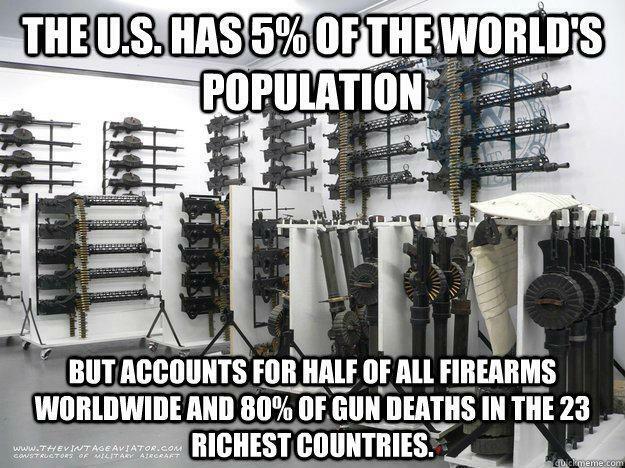 The group’s first post was a picture of an assault weapon with overlaid text: “The US has 5% of the world’s population, but accounts for half of all firearms worldwide and 80% of the gun deaths in the 23 richest countries.” The image has been shared over 8,300 times and liked by 655 people. Organizers told Current that early objectives include disseminating useful facts and figures about guns in the United States. “We want to put the gun control debate front and center and get the facts out there,” co-founder Mark Provost, 32 years old, told Current. But their longer term goals (perhaps by next week) include directly targeting the NRA. “We will be protesting NRA meetings where they happen and we will be putting public pressure on Congress,” Provost said. Provost added there will be an organized call-in to state and national politicians starting on Monday lobbying for gun control efforts. The debate over guns’ role in the group came to a head in July, causing a schism in the state’s movement, Current reports. A week later, James Holmes walked into a move theatre in Aurora, Colorado and murdered twelve people, injuring fifty-eight others. Needless to say, Provost rests firmly on the anti-gun side of the debate. “I was adamant that guns had no place in a peaceful movement,” he told Current. Additionally, there have been other various calls to protest the NRA outside of the Occupy community. CREDO Mobile tweeted a call to protest the organization on Monday, and a posting on Craigslist calling for a flashmob to decent upon the NRA headquarters in Washington, DC. Peaceful candlelight vigils began almost immediately after the Connecticut massacre, popping up in Times Square and in front of the White House, and of course in Newton. “Mr. President: We are praying for your action,” a sign read. The NRA isn’t the only organization keeping us from addressing gun violence. Check out John Nichols on how ALEC obstructs an honest debate about gun control.